More and more cities turn to curfews, prohibitions on begging, sleeping, or “camping” in response to the visible poverty in their public spaces, despite the fact that criminalization is “the most expensive and least effective” method of addressing homelessness. Jail costs two to three times the cost of supportive housing. A shocking report from the National Law Center on Homelessness and Poverty (NLCHP) documents a raging epidemic of anti-homeless laws sweeping the nation. “No Safe Place: The Criminalization of Homelessness in U.S. Cities” studied laws in 187 cities across the United States. In the cities surveyed, 34 percent ban camping and 57 percent ban camping in specific places. While 24 percent ban begging in public, a staggering 76 percent ban begging in specific places. Even though nearly all the nation’s vagrancy laws were long ago struck down as unconstitutionally vague, they have made a shocking comeback, with 33 percent of cities banning loitering and vagrancy, and 65 percent banning loitering in specific places. In addition, 53 percent of cities ban sitting or lying down in particular places, and 43 percent ban sleeping in vehicles. Nearly 10 percent of cities even ban sharing food with homeless people. A lack of low-income housing is the primary cause of homelessness. The report notes that 12.8 percent of the nation’s low-income housing has been permanently lost since 2001. Even cities with huge disparities in income and skyrocketing rents such as Berkeley, California, typically have “fewer available shelter beds than homeless people,” leaving people struggling to exist in public spaces. It is a simple equation: Fewer apartments and jobs plus skyrocketing rents and evictions equal more people flailing for housing, employment, and shelter. More and more cities turn to curfews, prohibitions on begging, sleeping, or “camping” in response to the visible poverty in their public spaces, despite the fact that, according to the report’s key conclusion, criminalization is “the most expensive and least effective” method of addressing homelessness. Criminalizing poverty makes matters worse. Jail costs an average of two to three times the cost of supportive housing. For someone who can’t pay a fine or raise bail, release conditional on the acceptance of a guilty plea can mean the loss of jobs, voting rights, housing opportunities and access to benefits. The U. N. Human Rights Committee declared the criminalization of homeless and poor people is a violation of the International Covenant on Civil and Political Rights, and successful litigation proves that criminalization of poverty raises serious constitutional concerns. From Berkeley to Orlando, Florida, cities have passed a river of anti-homeless ordinances that vary widely from city to city instead of using common-sense solutions: investing in affordable housing, increasing the stock of subsidized housing, using “Housing First” models for people in need, coordinating services, especially for those discharged from hospitals and jails, and training police and other officials to respect the human rights of homeless and poor people. The increase in laws that target poor and homeless people is “dramatic,” according to the National Law Center’s report, and makes life worse for an entire community. The United States Conference of Mayors surveyed 25 major American cities and found that between 2012 and 2013 there was a 4 percent increase in homeless families. But that has not stopped the wave of anti-homeless laws from accelerating. There is no state in the union, according to the report, where minimum-wage workers can afford a one- or two-bedroom apartment at market rent. Families that use their cars as temporary shelter run the risk of violating the laws against sleeping in one’s own vehicle in nearly half the cities surveyed, adding criminal charges to their already burdened lives. 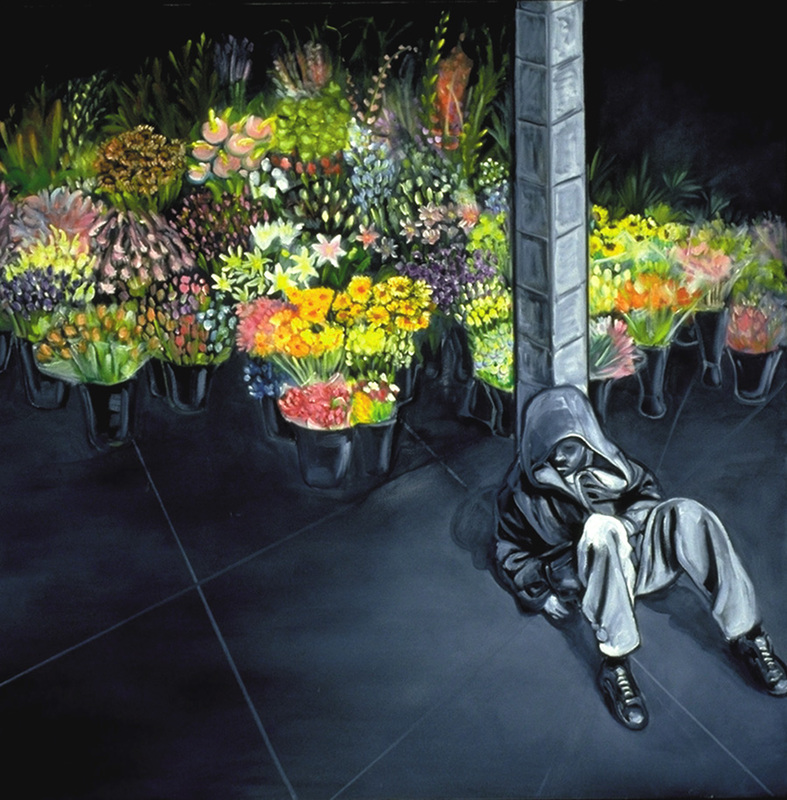 “Flowers.” Art by Jonathan Burstein. The “No Safe Place” report finds that homeless people are banished from sidewalks — yet businesses freely use public spaces. The Supreme Court of Appeal of South Africa found in one case that the destruction of temporary structures inhabited by “a group of homeless people on a vacant plot of land” was not only a violation of the Constitution, but also violated “various other provisions of the Bill of Rights that ensure personal security, dignity, and privacy.” The Supreme Court ordered the reconstruction of their structures. The Scottish law applies not only to homeless people, but also to people living in intolerable conditions. It recognizes the right to sue for violations of the law, and an “individual right to sell one’s house to the government to avoid foreclosure, but rent it back to allow one to maintain one’s residence through financial difficulty, perhaps ultimately repurchasing the home.” Homelessness in Scotland has “largely been reduced to a rare and brief occurrence” because of this focus on immediate housing as a judicially enforceable right. The “No Safe Place” report affirms the federal responsibility to promote and fund constructive alternatives in the United States, but advises local governments to simply eliminate anti-homeless laws that target the poor. The report suggests that cities which have discriminatory laws on their books be denied grants and investigated by the U.S. Department of Justice. Cities often point to the criminalization laws being passed in cities down the road as an excuse for passing similar laws, afraid if they don’t keep similarly repressive laws on their own books they will end up with the financial burden of caring for the people in need in an entire county or region. But the proliferation of homeless laws nationwide has shredded this argument to ribbons. This report is exactly what a politician pressured to pass another hate law targeted at poor and homeless people needs. No politician can be faulted for objecting to a policy that is ineffective, expensive, and guaranteed to extend the life of the problem it is trying to address. Criminalization of poverty is, of course, immoral in this, the richest country on earth. But the clear delineation of its sheer ineffectuality in this report is what may help finally change the politics of homelessness.